Selection: Sufficiently huge. One of the largest selections on the web. Quality: Fantastic, as long as you like the conversational hypnosis style. Email Subscription: Yes, they may send a moderate amount of emails, but they are very useful. In terms of technical prowess, Hypnosis Live may be the most professional hypnosis site on the web, hands down. You’ll be stunned at how nice this website looks, and more importantly, how perfectly it works (there’s nothing worse than buggy technology). Great websites are really uncommon in the hypnosis business, so this is somewhat of a Godsend (shady-looking websites happen to be the norm in the hypnosis biz). Everything looks good here though! When you sign up for their email letters, it even gives you help based on what email provider you have. That is TOP quality. They also display all of their security certificates, so you know that your info is safe when you sign up for them. The buying process is fast, easy, and they have a policy that is actually readable (not written by some stuck up lawyer who would rather just confuse you). HypnosisLive website looking and working great! The bundles are really well organized and are specifically formed around a certain persona, like the Multi-millionaire Wealth pack, or the Look Great Hypnosis pack– one that, for example, features recordings for slimming down, exercising, and a facelift all in one. Most people don’t realize this particular problem with using multiple hypnosis tracks… you generally cannot achieve all of the effects at once! They may cancel out and give you very little, because it is just confusing the brain. But with these hypnosis packs, they all surround a particular persona that you can happily change into, making it more effective instead of less! Just looking at the list of hypnosis packs, it gives you exciting new ideas on what you could create for yourself. Isn’t it nice to know that you can be, do, or have anything in this world? I think so. You get 4-5 recordings for the price of two, which is really good. The audio quality is pretty good, but not amazing. There is a little reverb (echo) going on. If you’re an audiophile with a set of good headphones, this might bother you. But it’s not a big deal for most. The background music levels are quite low, so the recordings are mostly voice, well spoken and clear. If you love background binaurals, the lack of background might be a buzzkill. They also use high-quality 192 kbs bitrate so it’s very clear. Well that’s the whole point, after all. As wonderful as it is to just bliss out in trance all day, you’re probably looking for some results, too! 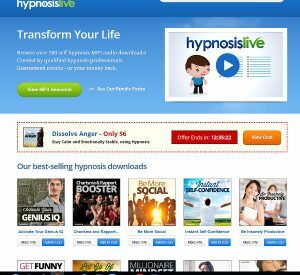 To test it out, I tried their A New You With Hypnosis bundle for $32, and they threw in a fifth recording for just 3 more dollars, so of course I took the deal too. That means I got 5 tracks for just $7 each! Pretty incredible for a hypnosis site. The great thing about the packs is that one of them might not resonate with you as much as the other ones. you can just delete that one and listen to the other 3! with these choices, you can really sculpt the creation of yourself. They use a long intro, which can be a little annoying (I think we are all well aware of what ‘hypnosis’ supposedly is, and the safety behind it, so get to the point, please), but you can just skip ahead five minutes to the actual session. After a few listens, I was a little put-off by the style of hypnosis used. I found myself wondering if the hypnosis was really working. Was I really becoming different in any way? It didn’t feel like I was improving… but our own perceptions can be deceiving. It didn’t seem to be making me any more fearless like it was supposed to. It was making me feel the same fear level, but then I realized it’s because I began challenging myself to the next level! It never really put me in the comfort zone because it made me much more willing to step even further OUT of that comfort zone. I found myself casually going to social meetups, interacting with groups of strangers as if we were already good friends. It was incredible! Something I was always interested in mastering. I didn’t even realize I was doing it, because the style of hypnosis used was so natural. Days later, I looked back and noticed that I normally would not be so effective in those situations. I also found my productivity steadily (slowly, but surely) increasing as I listened over the period of a month. Of course, this is all just my own experience, and your own mileage may vary. You will, of course, need to put in your own work– listen every day for a month, for example, and explore other activities that help grow you. And truly believe in what you can do! It’s definitely a form of hypnosis that works… even though it may not FEEL like it is working, unlike many types of hypnosis that you can feel instantly. The effect is very intriguing, mysterious, and hidden. In this way, the logical mind doesn’t get a chance to argue with it. Let’s be clear about this: changing one’s behavior and confidence is NO EASY TASK by any definition. We have lived with this set of fears, thoughts, and ideas our entire lives, and sadly, most people never escape the prison of these unconscious habits. Luckily, with hypnosis (and probably a lot of it), YOU CAN CHANGE these hardened blocks in your life. -Look for a 10% off code when you sign up. You might find the code in the top banner. -Get one of the bundles. The value is great, and you may not find quality recordings at that price anywhere on the internet. -Make sure you get on their email list, as they will sometimes send out coupons of 25% off or more. -Will often offer an extra related recording for a super cheap price when you are ready to place your order. 14 day NO QUESTIONS ASKED return policy. (Hypnosis Bootcamp also by J.A. Amos, has a gigantic 12 month guarantee though- now that’s confidence in your program). 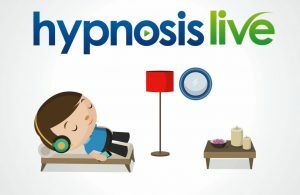 Hypnosis Live is a great site, with a fantastic hypnotherapist behind it. The conversational style is pretty brainy, requiring a lot of deep thought to make it work– but this will conquer any resistance that you my be holding. It’s a really great easy-listening experience. You need no effort to push your mind into some deep far-away land. If you respond exceptionally well to direct and focused suggestions (maybe you are easily suggestible in that way), then there may be better options available instead. Check the Best Hypnosis Page to find someone else. Wow, this is a great review! I’ve been exploring these sources, and they are much as you say. Thank you so much for posting this, it’s been very helpful.